When the rate at which distance changes changes, the measure of that is called acceleration. Acceleration is the rate at which velocity changes. Mathematically, it looks a lot like the relationship between velocity, position and time. The units of acceleration are the unit of velocity divided by the unit of time, most commonly it is the m/s/s or the m/s^2. Velocity describes how fast an object moves or how quickly an object’s position changes in a given direction. 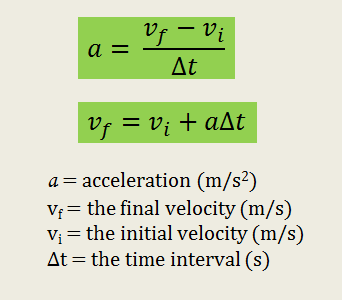 Acceleration describes how fast velocity changes. It is a rate of a rate. Acceleration not only describes how things speed up, it also describes objects that slow down. A positive acceleration means that an object is speeding up in the positive direction or slowing down in the negative direction. A negative acceleration means that an object is slowing down in the positive direction or that it is speeding up in the negative direction. Look at these four position vs. time graphs and try to describe each of these objects’ motions. A. The object is speeding up in the forward direction- a positive acceleration. B. The object is speeding up in the back ward direction- a negative acceleration. C. The object is slowing down in the positive direction- a negative acceleration. D. The object is slowing down in the negative direction- a positive acceleration. Acceleration is where the difference between speed and velocity becomes im­portant. Acceleration is the rate of change of velocity. There are three ways that the velocity can be changed. An object can speed up or slow down. It can also change direction. When speeding up or slowing down, the magnitude of the velocity (the speed) changes. When turning, the speed can remain constant while just the direction changes. There are three things that accelerate a car. The accelerator (gas pedal) speeds the car up, the brake slows it down, and the steering wheel changes its direction.